The 2 1/2" diameter Football Medallion is on a 33" long necklace with 7 1/2 cm beads. It provides an imprint area of 1 1/4" X 1" on the football and is a very inexpensive product to help promote your school, team or business. In minimum order of 150 they are less than $ 1.00 each. The Football Toss Cooler holds 24 to 36 cans or bottles and supports up to 50 pounds including ice in the cooler. It measures 16" wide X 16" deep X 30" tall with the backboard height of 60". Each set comes with three mini footballs to toss thru the hole in the backboardarea. Comes with easy to setup hardware and no tools are required. Minimum quantity of the stock FootballToss cooler is only one! Also available in a Basketball or Baseball version. Our football door mats measure 20" X 30" and have rubber backing. You can imprint your logo and text anyplace on the product and the minimum quantity is only 12. The football design is a stock design so you can place your custom imprint anywhere you may want on the gridiron door mat. You can pick your school or organization's colors for this 16" Inflatable Football Helmet. Available in a minimum quantity of 50 with your custom imprint. The imprint area is 5" wide X 3 1/2" high. Available as either a standard size football or a mini size these are real crowd pleasers. The standard size Signature football has a low minimu of only 10 and provides an imprint area of 3" diameteror 2" X 5" depending upon the artwork. The mini Signature football measures 7" and has an imprint area of 1 3/4" diameter or 1 1/2" X 2 1/2 with a minimim quantity of 25. 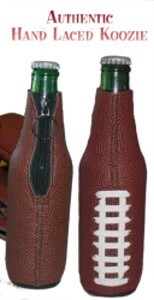 Here is a great product for tailgating parties, team building promotions, game day give-aways, schools and colleges. It has the look and feel of a real football because it is made from real leather. Imprint area is 2 1/2" X 2 1/2". Minimum order quantity is 500. Great product for use as an award aor for back yard use. Seats four of your favorite fans or teamates plus a large area for your football picnic spread. Call for current pricing. The Football Helmet Snack Tray with plastic bucket in center and tray in face mask is made of durable plastic and measures 10" high X 9 1/4" X 12" deep. Football helmet is a full size replica of an actual football helmet. Abailable in 13 different colors. Minimum order is18. Please call us at 800 960-9080 for current pricing information. Combined as a package the 3" X 4 1/2" Football can holder and the 3 1/2" X 2 1/4" football shaped stress reliever make a powerful football package for your custom imprint. Available with your custom imprint in a quantity of 100. The 2 1/8" X 2 3/8" Football Helmet Magnetis available in a variety of colors for your schoo team or football related business or organization. Available in minimum quantities of 250. The Mini Football game comes with a foam goalpost and foam football. You can make your own rules for the game. The foam goal post measures 5" high X 4" wide and it is wide enough on the bottom to stand up on its own. The foam football measures 2" x 1" . Both the goal post and footballs are custom imprintable and are available in nine different foam colors. This kit loves sports. The blanket is 100% acrylic, machine washable and dryable. It's 50" X 50" in tan plaid. The deluxe vinyl case zips apart to form two cushions with an inside pocket to hold your program and other essentials between your legs. The kit includes a General Electric AM/FM stereo headset radio. Minimum quantity is six. Pictured below are rubber footballs and handsewn synthetic footballs with custom imprints. The rubber footballs are available in full size of 11"-11 1/2", medium size 10 1/2" -11" and small 10"-10 1/2". These have the finest rubber cover with raised laces, 2 ply 100% butyl bladder and it is available in brown or custom colors. The handsewn synthetic footballs are available in full size of 11", medium size 9 1/2", small 8 1/2" and mini 6 1/4". These footballs have synthetic leather pebble finish ans is available with one smooth white panel for autographs. Minimum order with a custom imprint is 120 footballs. Here is one of our most popular items over the years. It is a simple coin purse that everybody just loves to use and have a football schedule so readily available at hand. It makes real cents to consider this item for your next football promotion. These coin purses come in a variety of colors and give you a great two side imprint. The actual size of the coin purse is 3" in length. The minimum imprintable order with your custom imprint is only 250. Another great idea for your football team is that of a magnetic football schedule. The schedule magnet pictured below actual size is 3 1/2" X 2 1/2" with an imprint area of 3 1/4" X 2 3/8". 250 is usually minimum and you are only limited by your own imagination as to what you would like on your schedule magnet. Here is a great item to keep your drink cold. This football helmet can holder looks like a football helmet and comes in a variety of colors. Minimum imprintable quantity is 250. We have many types of imprintable footballs available, the mini-footballs pictured below are a 6" ball that are available in red, brown, yellow, orange, white, blue and green. Available stripe colors are black, white, maroon, red, green, purple, light blue, dark blue, orange, yellow and brown. Imprint can be done in black, white, red, green, purple, maroon, brown, orange, yellow, light blue, dark blue, teal, gold and silver. We can print in either one or two colors with or without stripes. The choice is yours. The imprinatable area is 2 1/4" X 1 1/2". 250 is the minimum. Give us a call and we can kick around some ideas on what we can print on your balls ! These football hats are a great party or game day product. Available in quantities as low as 25. They are non-imprintable. The 2" size football shape ice cubes provide an imprint area of 3/4" X 1/2" and the minimum imprint quantity is 150. This 35mm football camera measures 4 1/2" X 3" X 2" and offers an imprintable area of 1" X 3/4" with a minimum imprintable quantity of 100. It is also available with camera fronts of basketball, baseball and tennis. The Pro's Choice High Pile Plush Woven Throw has a unique football field and logo design combined with a strong blend of 90% acrylic and 10% polyester make these high pile, plush throws with your favorite NFL licensed stadium blanket. These are available in all NFL designs and are 50" X 60" packaged in a clear poly bag with a snap handle. The Throws are machine washable and dryable. Minimum order is four Throws. These oversize floor cushions are ideal for beds, couches and make great floor seats ! Available in NFL team designs and logo. Made in USA these cushions are 26" X 26" and made from cotton duck. Minimum order is a quantity of ten. 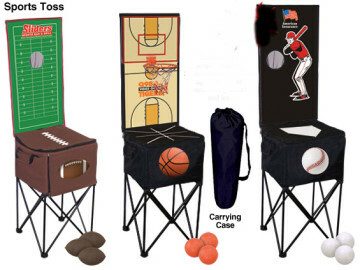 We have many shapes of seat cushions that include football, basketball, baseball and soccer. If you are a rooter or need to have seat cushions available for your school or club we would be glad to help you with our ideas. Seat cushions are available in various sizes, materials, colors and thickness. Pictured below is a vinyl seat cushion..
Our football keytag made of rubber measures 1 3/8" X 3/4" with a minimum imprint quantity of 300. The plastic disc provides an ample area for a custom imprint of your choice. 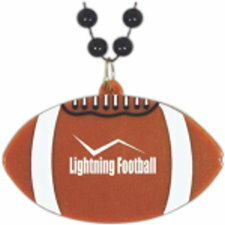 These 4" football shaped bottle opener keytags will keep your advertising message as close at hand. It provides an imprint area of 1" X 1 1/2". Minimum imprintable quantity is 150. These football folding binoculars actually fold up and look like a football when not in use. We also have folding binoculars available for tennis, basketball and baseball. Minimum quantity with an imprint is 50. We have many types of football decorations available whether it be for your football awards banquet or any other football related party. Pictured below on the left is a centerpiece that measures 11" while the one on the right is 10". The pictures at the bottom area show various 10" football cutouts that are available for your rooters. Here is a 12" inflatable vinyl football that both the kids and adults are sure to get a kick with. Its lightweight construction makes it very playable especially for the younger ones. 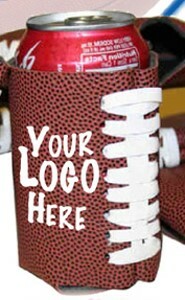 How about putiing your college, school or club football schedule on a can wrap ? Here is a good example of how a can wrap can help your fund raiser or to promote your team. Here is a tasty treat for those tailgater parties before that all important football game. Yes that is a football which actually a one pound beef summer sausage that is seasoned and smoked to perfection. The Tailgater comes complete with a half-pound of mild cheese, six ounces of fresh-roasted deluxe mixed nuts, a half pound of refreshing gourmet mints and a box of Bremner sesame wafers. The walnut and hard maple cutting board comes complete with your logo and imprint. Minimum imprinted order is only 12 Tailgaters. This is only one of our food items that can be used for your football parties. The Super Football Phone is a great award and for an imprint only a minumum quantity of 25 is required. It measures 10" X 7" and your custom imprint goes on the base of 2" X 2". It is only one of many electronic items that we can imprint for your group or organization. This football gold plated key ring can also be used as an award with or without a key chain. It's great for parent groups, booter groups and for all types of football awards. Need a specific football related item or a general catalog ? Give us a call at 800 960-9080 or 206 285-5359 and we will be glad to send one out.